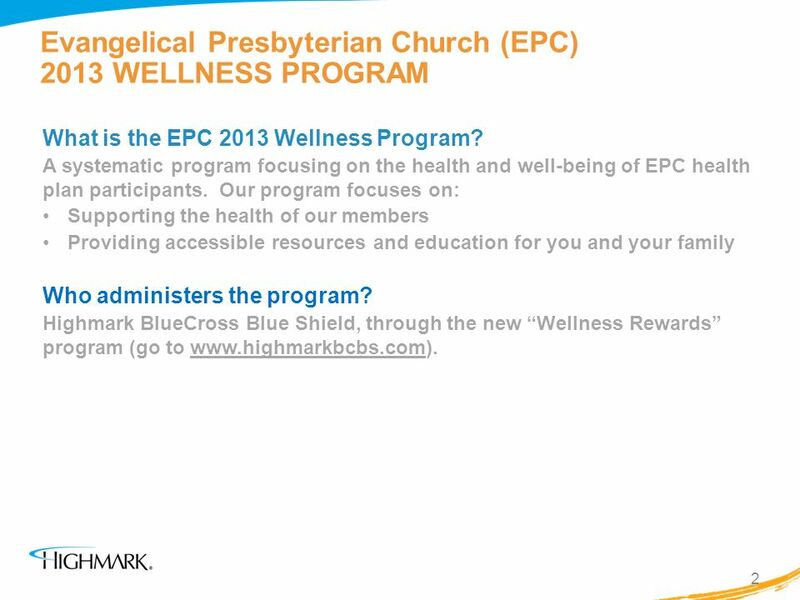 Evangelical Presbyterian Church (EPC) 2013 Wellness Program with “Rewards” HIGHMARK.COM. Program Length: Eleven months long – from 1/1/2013 to 11/30/2013. Who is Eligible: Participants in the EPC Medical Plan plus covered spouse, if applicable. 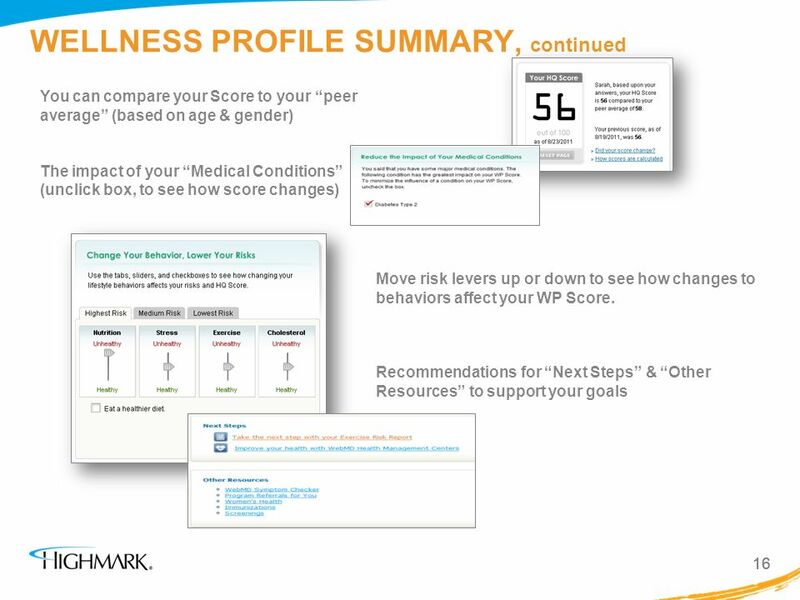 Program Activities for Reward: Wellness Profile – Complete a brief questionnaire to learn more about your health and receive a confidential, immediate personal plan. 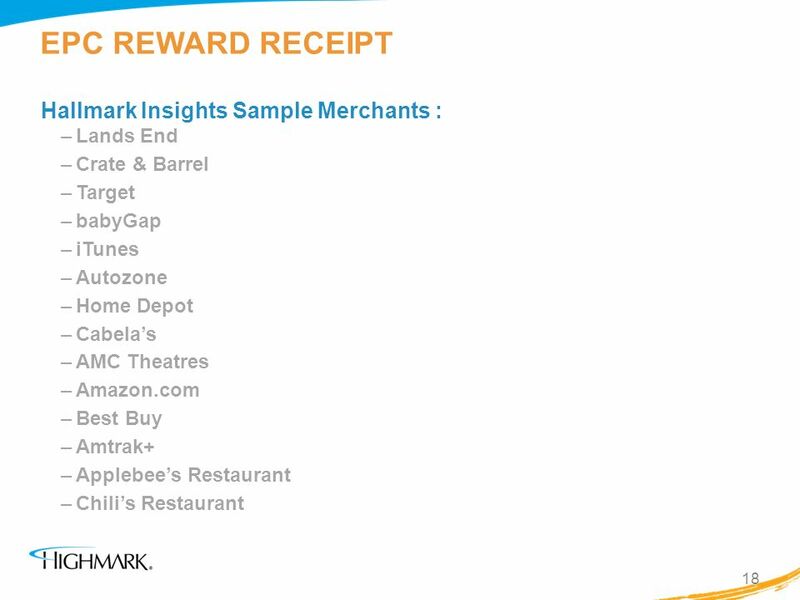 Reward provided: $50 Premier Choice Award redeemable at ~200 selected retailers. Go to: and select the “Members” tab Enter User ID & Password in the Log In box, Or For new registrants click “Register Now” New Registrants will receive a PIN to allow complete access Getting started is easy! 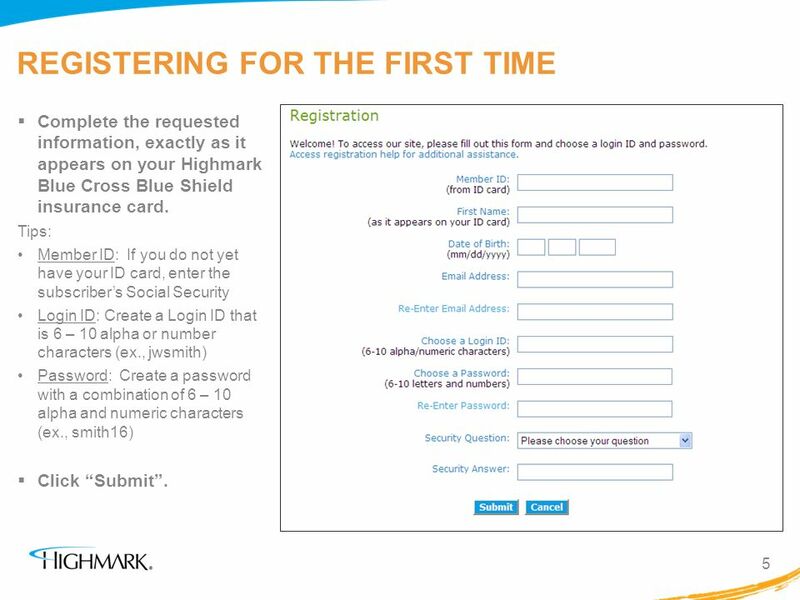 Complete the requested information, exactly as it appears on your Highmark Blue Cross Blue Shield insurance card. Tips: Member ID: If you do not yet have your ID card, enter the subscriber’s Social Security Login ID: Create a Login ID that is 6 – 10 alpha or number characters (ex., jwsmith) Password: Create a password with a combination of 6 – 10 alpha and numeric characters (ex., smith16) Click “Submit”. 7 PIN DELIVERY METHOD You can elect to have your PIN sent via , text, voic , or postal mail delivery. ( and text delivery are the quickest options.) 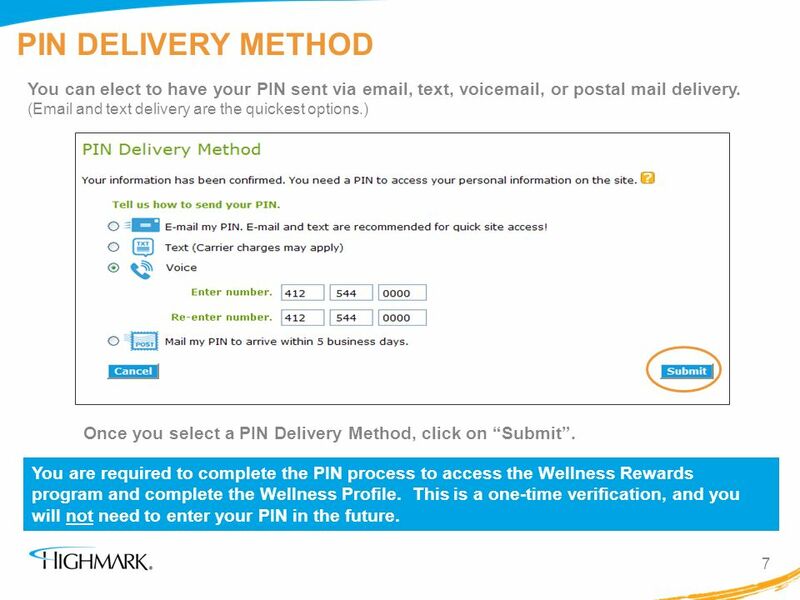 Once you select a PIN Delivery Method, click on “Submit”. 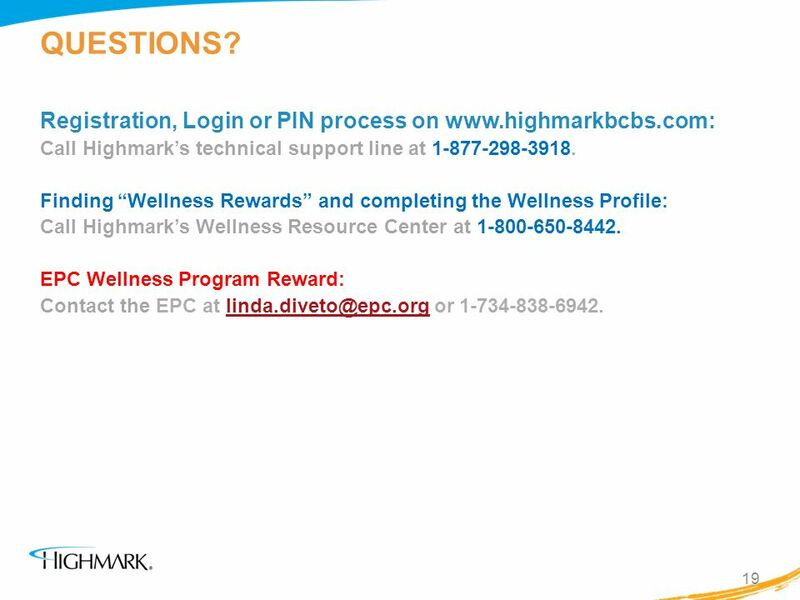 You are required to complete the PIN process to access the Wellness Rewards program and complete the Wellness Profile. This is a one-time verification, and you will not need to enter your PIN in the future. 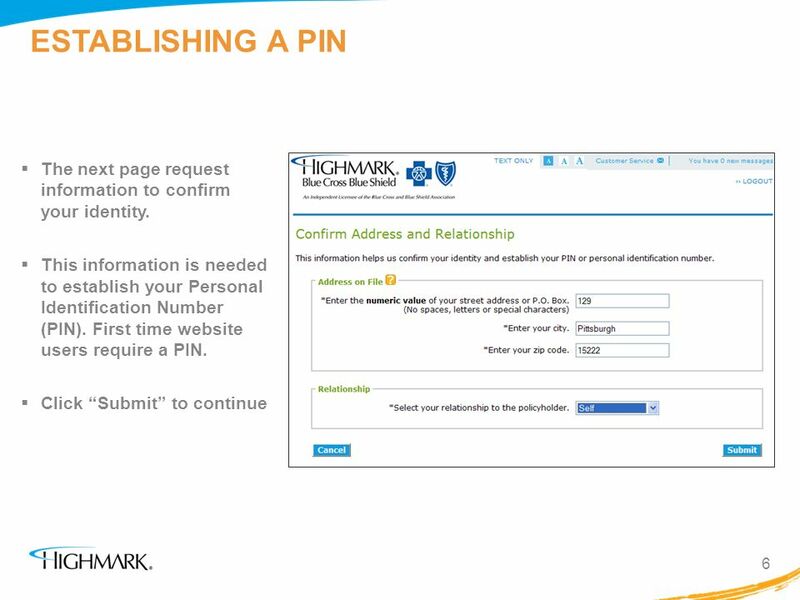 8 ENTERING YOUR PIN Once you receive your PIN, you will be asked to enter this information the next time you log into the website. This is the only time you need to enter the PIN. 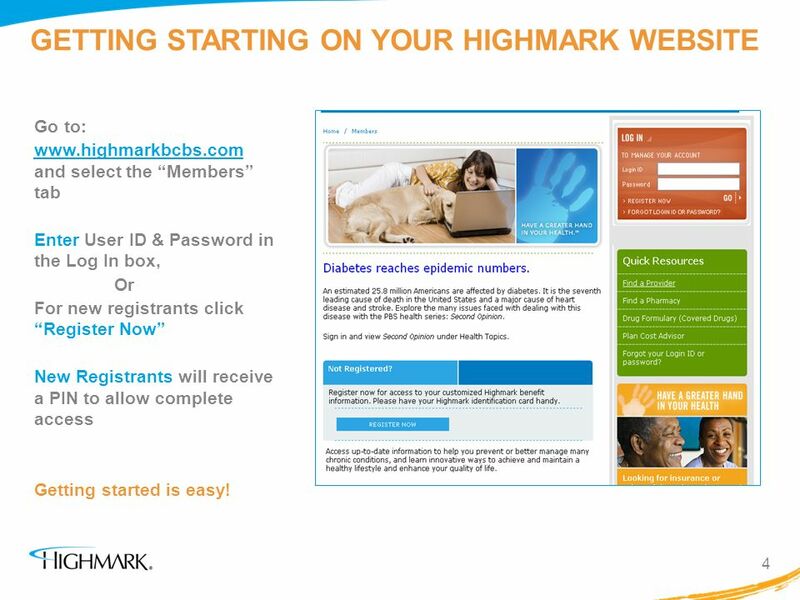 Thereafter, you can log into the Highmark site with only the Login ID and Password you created. If you already registered, but did not complete the PIN process, select “Reissue Your PIN” and follow the steps to get one. 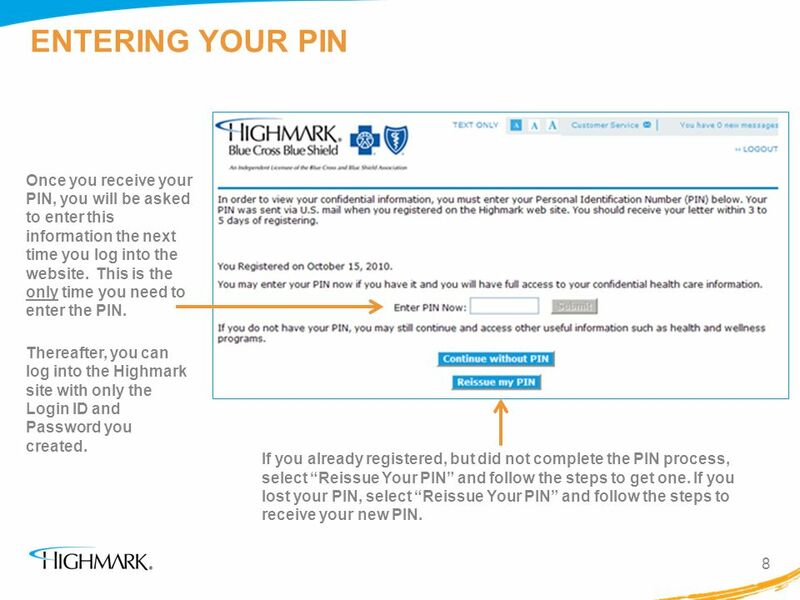 If you lost your PIN, select “Reissue Your PIN” and follow the steps to receive your new PIN. 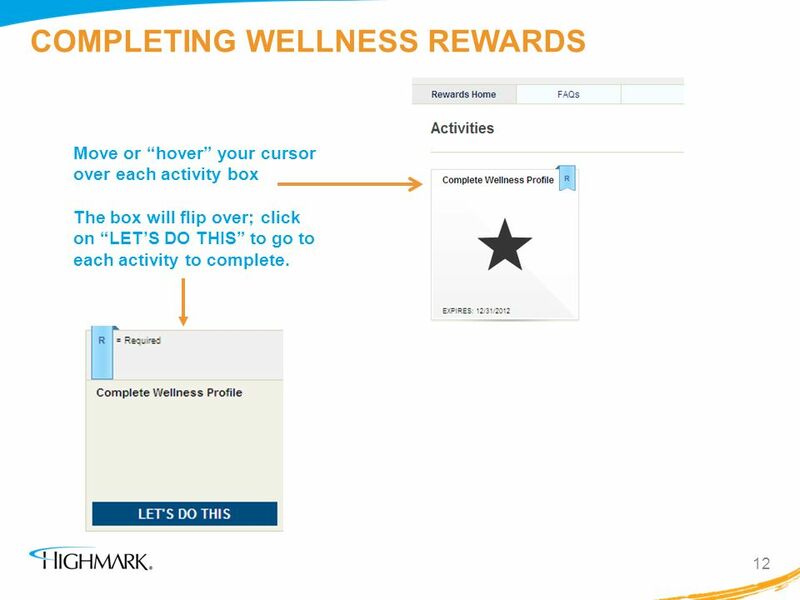 Activity (Wellness Profile) that earns reward is shown in box. 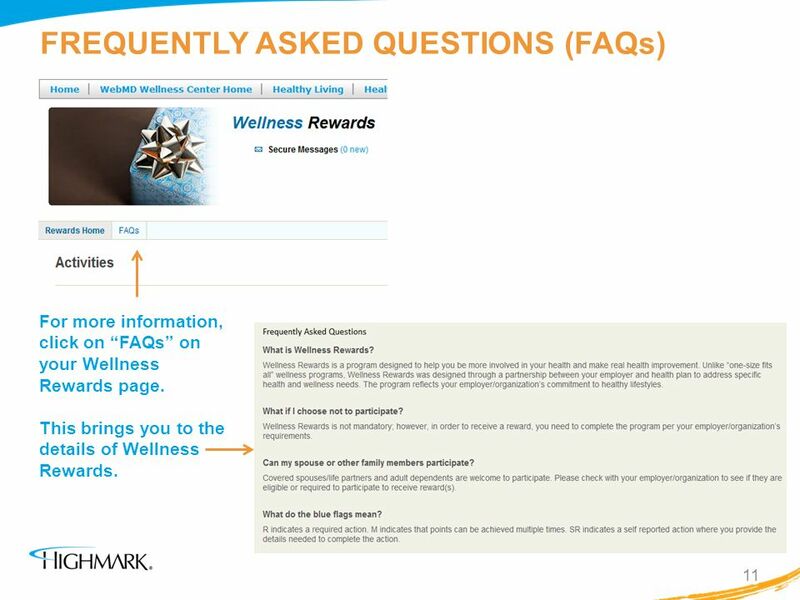 For more information, click on “FAQs” on your Wellness Rewards page. 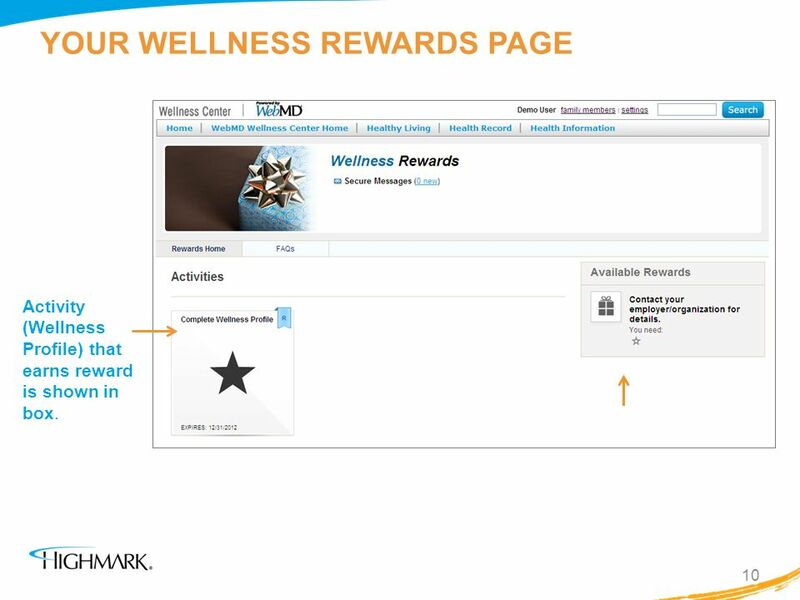 This brings you to the details of Wellness Rewards. Move or “hover” your cursor over each activity box The box will flip over; click on “LET’S DO THIS” to go to each activity to complete. 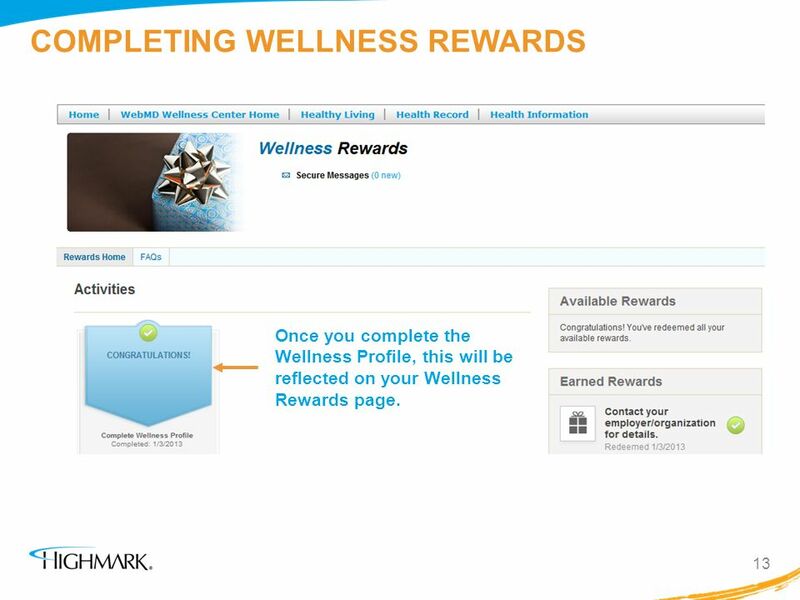 Once you complete the Wellness Profile, this will be reflected on your Wellness Rewards page. 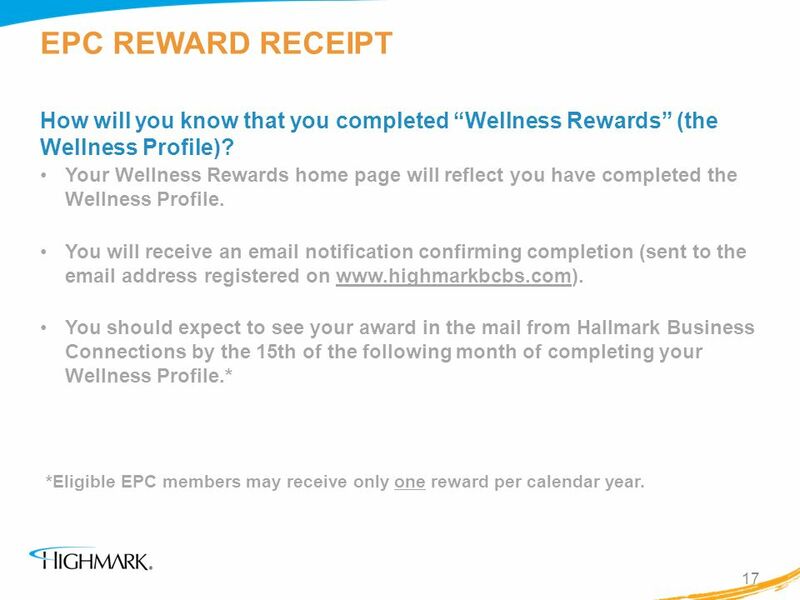 17 EPC REWARD RECEIPT How will you know that you completed “Wellness Rewards” (the Wellness Profile)? 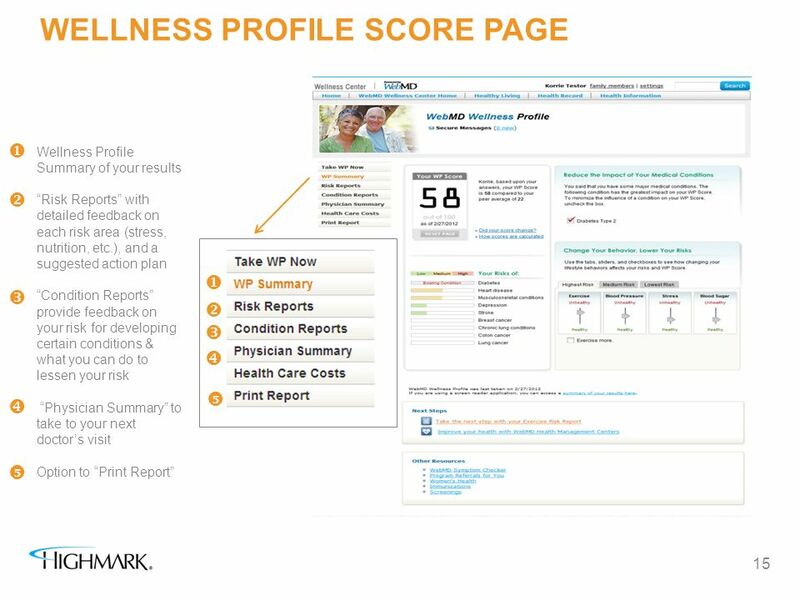 Your Wellness Rewards home page will reflect you have completed the Wellness Profile. 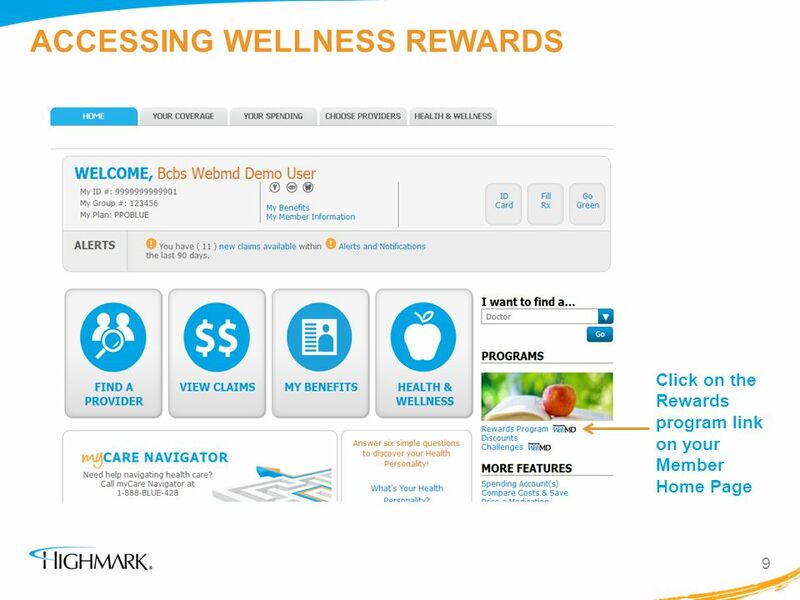 You will receive an notification confirming completion (sent to the address registered on You should expect to see your award in the mail from Hallmark Business Connections by the 15th of the following month of completing your Wellness Profile. 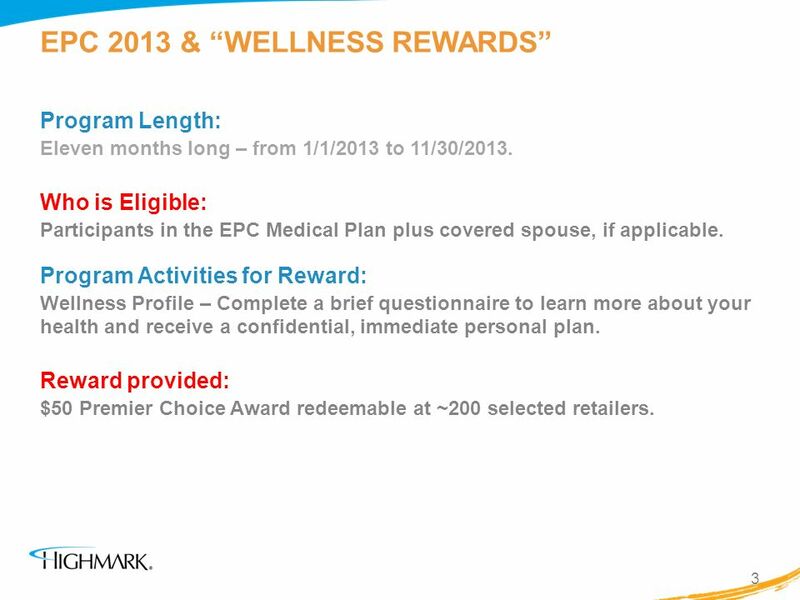 * *Eligible EPC members may receive only one reward per calendar year. 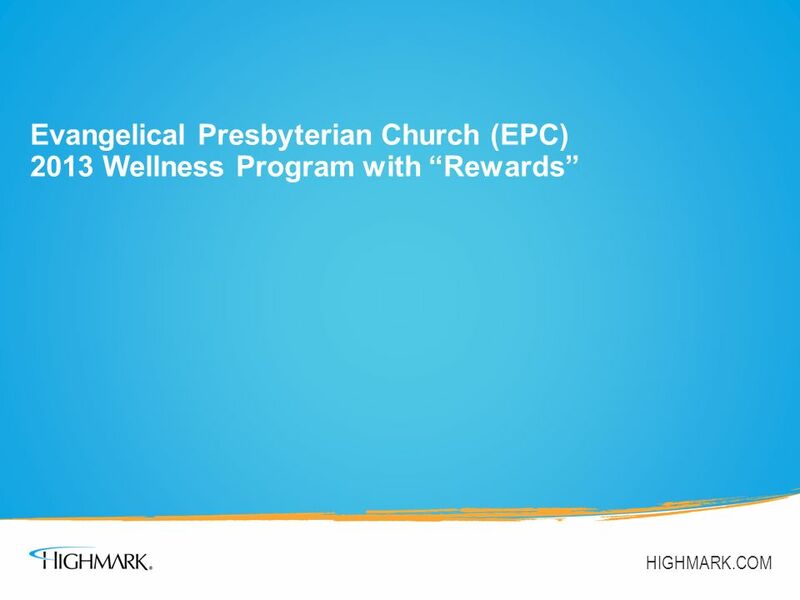 Download ppt "Evangelical Presbyterian Church (EPC) 2013 Wellness Program with “Rewards” HIGHMARK.COM." 1 Take a tour of De Gruyter Online Join the rally and learn how to navigate through our website. 1 PLAY 60 Challenge Online Tracker. 2 Introduction The PLAY 60 Challenge Online Tracker is a web based physical activity tracker teachers across the country. ©2010 AECsoft USA Confidential External User Guide AECsoft USA, Inc Yorktown, Suite 435 Houston TX ©2010 AECsoft USA Confidential. 6/2/ Online Group Enrollment. 6/2/ Introduction Thank you for choosing Online Enrollment! 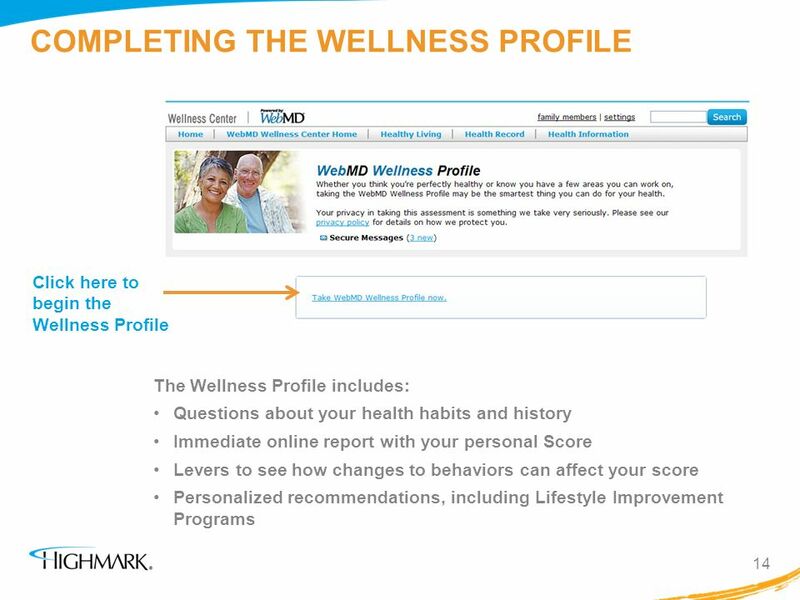 This presentation will walk you through the Online. Welcome to Access Online for State of Iowa Cardholders. 1 n SWABIZ for Connexxus Program Overview Fall 2009. How to Navigate the IFPUG Member Services Area 1.